Goodreads: Abandoned as a baby, Andy McNab's start in life was tough. Growing up in South London with foster parents, and surrounded by poverty, he attended seven schools in as many years, disillusioned and in remedial classes. It wasn't long before his life descended into petty crime. By the age of sixteen, he was in juvenile detention. 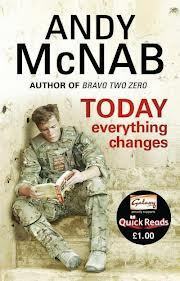 Today Everything Changes is the story of Andy McNab, it follows him from a small child on the streets of London, to Juvenile detention, all the way through his time in the army and SAS. I loved reading this book, although it was only short i thought the message behind it and what Andy McNab went through is inspirational! I think what made me love this book so much was Andy's Struggled to make something of himself! Not many people will know this but at the age of 14 i got told i would never pass my GCSE's, by age16 i still couldn't read very well and got stuck on words so because i couldn't read i stopped reading and therefore never got better. My mother was much like Andy's, she worked constantly to pay the bills so i grew up with the bare minimum, she had 3 kids which also meant no one had time to help me with my education or to teach me to read and my step dad used to say i was thick and stupid. At 16 i went to college and in an attempt to not feel stupid i stuck in but still wouldn't read allowed in class, thanks to twilight i found i started to enjoy reading and the more i read the better i became. There is one line in this book that stuck with me " Never forget that reading gives you knowledge, which gives you choice and opportunity in whatever you want to do in life" I am now a Psychology graduate going to in to further education and i believe reading helped me make a better future for myself. I think the message in this book that its not where you came from or what you have that is important its what you make of what you have. Andy McNab worked hard and made a successful career for himself!